Limited Stock: 11 left. Buy now from Amazon.com! This mini-breadboard and jumper wires kit is ideal for making electrical connections and for testing purposes. The breadboard has 170 point with standard 0.1" (2.54mm) pitch. Packaged in a zip lock bag. 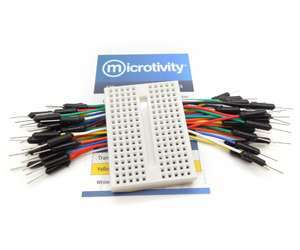 Why choose our Mini Breadboard kits: The included jumper wires allow you to connect different components quickly. Wires come in different colors and therefore so it won't be hard to trace the circuit. The mini breadboard is prefect for creating small circuits, to act as a secondary circuit of a major system, etc. They are also nice for use in size-constrained environments such as attaching on to a robot car.